[limited release for 2013] Despite some good-natured ribbing about their icky Stuff'd frozen dairy desserts, I've always been a huge fan of Turkey Hill ever since I was a little kid. They're just a great mainstream company that gets the idea of providing reliable regular flavors, an assortment of product lines, and then spicing things up with their monthly flavors (which is often a stepping stone to becoming a full time offering). 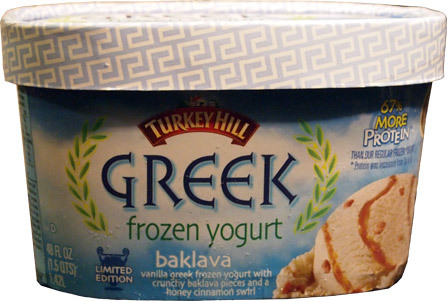 Today's case in point is the limited edition Baklava Greek Frozen Yogurt. Vanilla Greek Frozen Yogurt with Crunchy Baklava pieces and a honey cinnamon swirl. So many interesting words in that description. Everyone and their cousin is doing Greek Froyo nowadays but I finally feel like we're seeing some creativity in the space. Popped open and it's pretty white, but I see potential here. I think a lot of us were jealous when fellow bloggers like Junk Food Guy got to scoop this up first, especially when he fell in love with it, but now it's our turn to enjoy. 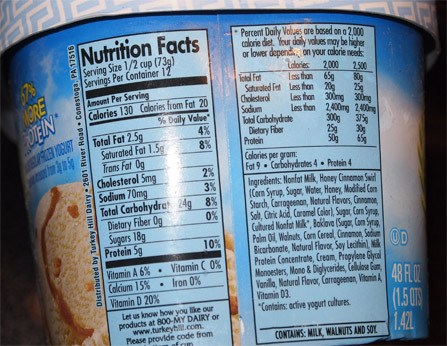 Let me just take one more quick picture of the nutritional info. Cool, talk about no guilt. Fairly low calorie, low in fat, high in protein.and.... umm, wait, walnuts? I'll admit I don't exactly remember what baklava is, I eat a lot of snacks and they kind of all get jumbled up in my memory sometimes, but nuts? I know it's pastry, it's a treat, and my mom's always been a fan, but baklava has nuts? Ok, now you know too. Wow, now that's a big thick honey swirl! It didn't seem too large at first, but that last big scoop really hit the motherload. 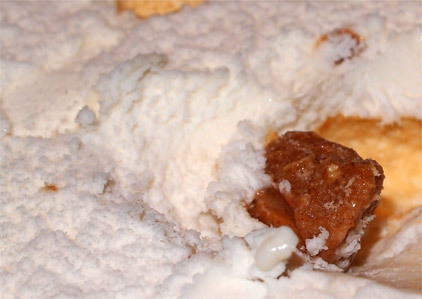 It's got a nice brown cinnamon-y hue and I just can't resist the urge to dig up a spoonful (or two) of the stuff. It's good. They seem to have tempered it a bit, it's not just a wallop of pure honey, they do try to balance it out a bit... ok, one too many samples, honey overload, I need to balance my bites with a bit more base froyo. The base is nice, especially considering it's greek frozen yogurt. 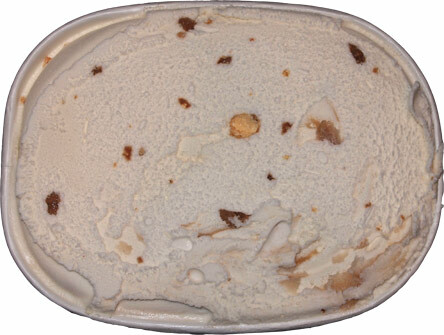 It's like a well done light ice cream with a respectable texture that's light but enjoyable. Yoplait has the texture of yogurt that's been frozen, but this is definitely aiming to belong in the ice cream aisle. Another positive is that the Greek tang isn't hitting me, or at least it's hiding behind all of the honey. Either way, I'm happier this way. Ok, I'm not a huge fan of honey (well I was as a kid, but my love has waned over the decades), so I think I need to even things out a bit. I smushed up the final scoop and it did a nice job of spreading the flavor out. Thing is, for me, it's still at that borderline of overpowering. Thankfully it's nowhere near as oppressive as the Stonyfield Honey greek froyo, but be aware that this is no timid swirl. Let's get back to the baklava before we leave. Looks awesome doesn't it? Now I was a bit confused at first because I thought I was eating crunchy, sugar coated walnuts, but that's not the case. The big bits actually have this crunchy crumb center where all the flavor is coming from. These bits are excellent and are easily my favorite part of a this well made product. So in conclusion, it's a nice job by Turkey Hill. While the flavor profile doesn't exactly suit me, you can tell that they've gone the distance to make this a treat and not just some foo foo fad. There's no denying that this dessert inspired take is my preferred method of breaking into the greek froyo scene. I don't need the double caloric intake of Ben & Jerry's, the funny texture of some brands, or the tang of the other brands. I want this to be a dessert first, and everything else second and they've done that here. In fact, I'm pretty sure this would fly as a nice breakfast too (maybe with some nice cereal crunched up on top). On Second Scoop: Continued thumbs up despite my low honey tolerance. The people willing to try this won't be disappointed in their search for a nice light greek froyo dessert. I've been wanting to try this stuff, but haven't been able to find it! I'm still not completely sold on this Greek frozen yogurt craze. there are a fair amount of places that carry turkey hill around me, but they tend to play it way too safe with what they order. If you dig honey you should definitely like it. I think overall response to the Stonyfield fro-yo honey must have been poor because I spotted it this past weekend for $1 in the freezer cases of our local Dollar Tree store. I also spotted Lindy's orange Italian Ice there too (I product I love on a hot summer day). I wish I could find and try the Lindy's gelatos. They have some interesting flavors on their website. 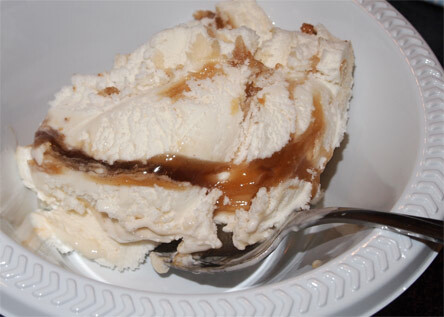 It's been a couple months since I had this, but I thought it was really similar to Ben & Jerry's Vanilla Honey Caramel. Only less tangy and the baklava pieces make it a bit better! @Anne: Lindy's makes gelato?? never seen it!